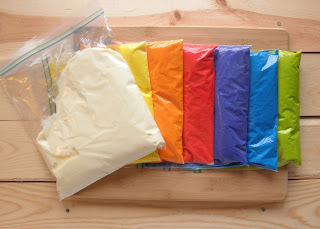 My husband StumbledUpon a picture of a rainbow cake one day, and I thought it was so gorgeous that I immediately started thinking of other baked goods that would look good in rainbow colors. The cheesecake was one of the first things I thought of, and I was pleasantly surprised at how well it turned out. 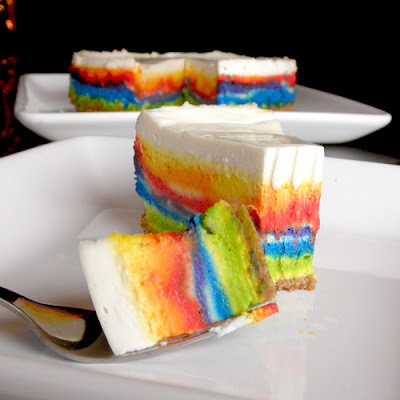 Since then I've seen other pictures of "rainbow cheesecakes," but they don't do justice to the name. 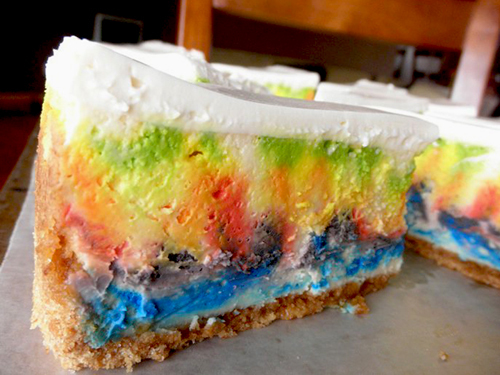 To me, a rainbow needs to be vibrant, not pastel, and I think you can see that this cheesecake fits the bill. To get this kind of color, I don't think you can use the Cake Mate colors you get at the grocery store. 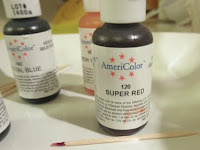 You're going to have to go to a hobby store like Hobby Lobby, JoAnn's, or Michaels and get some real gel paste food color, like the ones pictured below from AmeriColor. It's worth the trip. Price-wise, the gel paste doesn't cost too much: $1.75/bottle. If you mix your own colors, you only need to buy three. I recommend buying purple though, because I have yet to mix a pretty purple on my own. This cheesecake is not only pretty, but it's tasty too. The picture at the top is my second whole rainbow cheesecake, and I decided to try smoothing out the colors after each addition. I think I like the bumpy look of my first attempt pictured below. In that case I just squeezed the color evenly over the bottom layer and left it unsmoothed before adding the next layer. I've also made an American flag version of this cheesecake too using this technique, for my brother-in-law's citizenship celebration. Either way, it's a fun and tasty cheesecake. Mix together and put in bottom of a 9" spring form pan that's been lined on the bottom with a parchment circle. *I like to crush my graham crackers in a zip top bag. I use a rolling pin to crush them. Then I mix the sugar into the crumbs in the bag and then the melted butter. I squish it all around with my hands and pour it into the pan. Saves washing one more bowl. If you don't have a plastic roasting bag to use for this, you will want to cover the bottom of the pan with 2-3 layers of heavy duty foil to keep the water out from the water bath you will use during baking. Cream cream cheese until smooth. Add sugar and beat until smooth. Beat in eggs, sour cream, and vanilla. Stir in heavy cream until incorporated. Set six unzipped sandwich sized zip top baggies in six small cups. Place a 1/2 cup of batter into each baggie. Pour the remaining batter into a gallon sized zip top baggie—this will remain white. Three layers down; 9 to go. 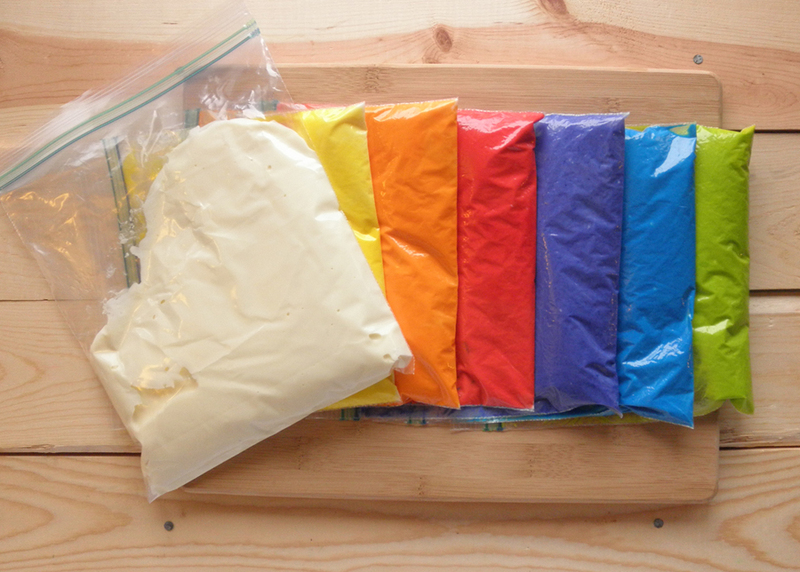 Mix batter with food coloring to produce one baggie each for the following colors: blue, green, yellow, orange, red, and purple. Start with two or three drops of color and gently squish around with your hand. Add more food coloring if necessary. Zip tops when done mixing colors in. Start with the baggie of plain white batter. Cut about 1/4 inch off one of the corners of the baggie and “pipe” in enough to just cover the crust in the bottom of the pan. Carefully set bag aside with the cut tip pointing upward and the "top" tightly zipped. Next, cut 1/4 inch off the green, and pipe squiggled lines all over the top of the white batter. Try to cover the white as much as possible, but know that there will still be some white patches left. Pipe on a layer of white, and this time, try to cover as much of the green as possible while still making sure there's enough white for all the other layers. Then pipe with blue, and so on, alternating colors with the white until you’ve used all the colors in the rainbow pattern. Hopefully you’ll have enough white left for a final layer of white on top. Place the pan in a large plastic roasting bag (like the ones used for turkeys), and then place that in a large roasting pan and pour in very hot water to reach half way up the pan sides, being careful not to splash water onto cheesecake. 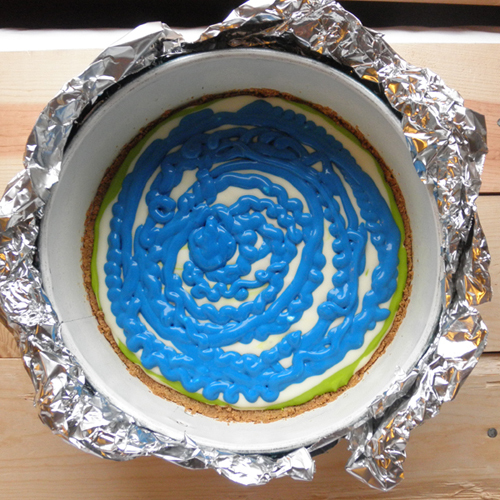 Bake at 350° for about 60 minutes or until cheesecake has risen and center is set. Remove from oven and pour sour cream topping mixture on top and smooth out. Return cheesecake to oven for another 5-10 minutes. As soon as you take pan out of the oven, run a knife around the edge of the cheesecake to release the cheesecake from the sides. Allow to cool completely on a wire rack. Refrigerate overnight. Rainbow Cheesecake my first try. This was made in a 9" pan. 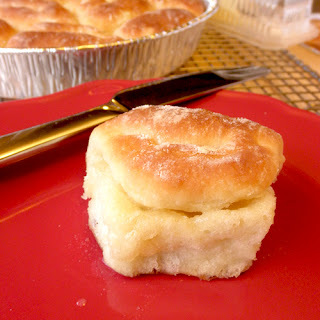 These rolls are a family tradition. Outsiders don’t necessarily adore them the way my brother and I do. My Grandma Kelly would make these before we’d visit, freeze them, and then serve them to us each morning piping hot from the oven. I kind of think she probably made other breakfast foods to go with the rolls, but I don’t recall eating anything else but these as I sat in her cozy kitchen in the Santa Cruz mountains, watching game shows with Grandpa Kelly as he sat in his EZ chair next to the kitchen table. 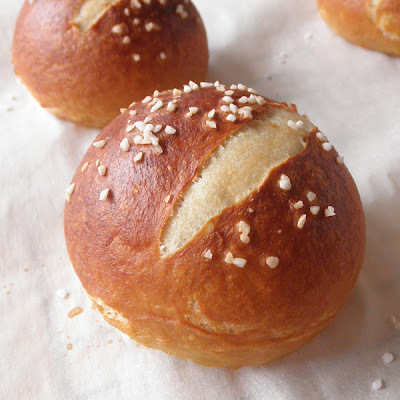 These rolls have a nice thin crust on the outside, and are light, moist, and tender on the inside. Because you butter the dough and fold it over, they're easy to open up to butter the middle again once they're baked. Yeah, these aren't low fat. Piping hot with melty butter. So good. Mmmm…I could eat half a pan by myself. 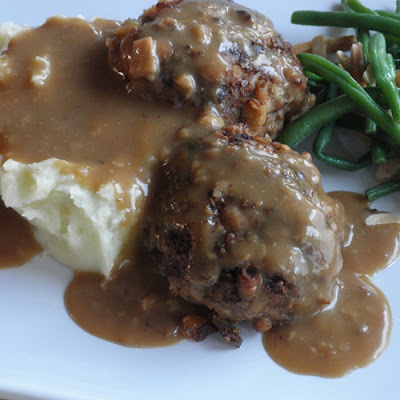 They’re also delicious eaten with leftover turkey and gravy. In a large saucepan over medium-high heat, scald the milk (bring just to a boil). Pour into a very large heat-proof mixing bowl. Add 1 stick butter. Allow to sit for about 30 minutes to melt butter and then cool slightly. In a small bowl, mix the yeast and 1/3 cup warm water. Sprinkle with a little sugar so that when it activates, you’ll be able to see it’s alive by the bubbling action. When the milk/butter mixture is just warm (105°-115°F), whisk in mashed potatoes, sugar, salt, and yeast mixture. Whisk in 4 cups of flour. Then whisk in beaten eggs. Switch to a sturdy spoon and stir in the remaining 4 cups of flour. Stir until well mixed. Dough will seem more like a thick batter than a bread dough. Place in a very large greased bowl (I use my Tupperware “That’s a Bowl”), sprinkle with a little flour, cover with plastic wrap and a clean wet dish towel. Set in a warm place to rise. Let rise for 1- 1 1/2 hours, or until doubled. While dough rises, butter 5 cake pans (I use disposable aluminum) and preheat oven to 400°F. Soften second stick of butter on a microwavable plate in the microwave. Flour a sheet pan to hold the cut rolls before they go into the pan. Once dough is doubled, punch down and then turn out onto a well-floured surface. Generously sprinkle with more flour. Flatten to about one-inch thickness. Cut into circles with a 2” biscuit cutter. Set circles aside on the floured sheet pan. Gently knead scraps and cut more circles until you can cut no more. Take one circle at a time and dip half of one side in the softened butter. Fold circle in half and press deeply along the rounded edge with your fingertips. 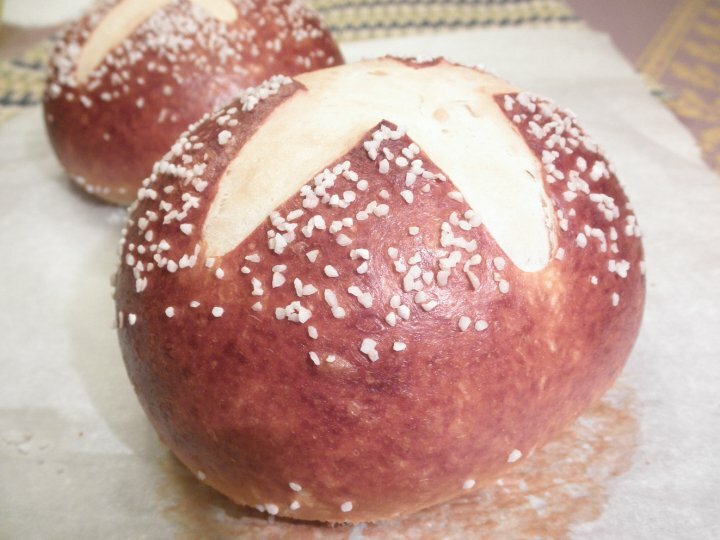 Place shaped rolls into pan around the outside first, and then make an inner circle. Fill each pan up. Cover pans with plastic wrap and let rise for about 1 hour, or until doubled. Bake at 400°F for about 15 minutes, or until deep golden brown on top. Remove from oven and allow to cool, or get one out quickly and put some butter in the middle and enjoy. 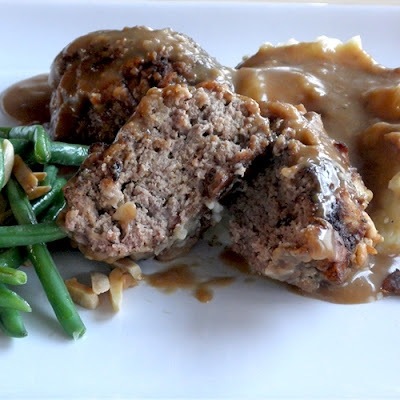 Serve hot or allow to cool completely, wrap in heavy-duty aluminum foil, and freeze. Reheat by placing in a 350°F oven for 15-20 minutes. That’s how I would enjoy them for breakfast at Grandma’s house. 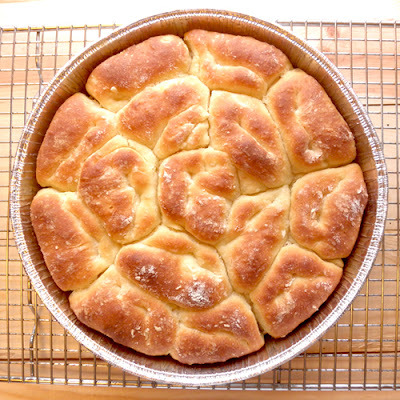 Makes 5 pans of rolls. Buttered and ready to be enjoyed. I love cream puffs. I love banana cream pie. This is a natural merger of those two wonderful desserts. 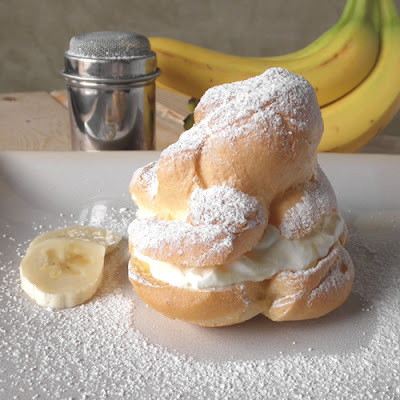 Inside this cream puff lies a bottom layer of banana chunks mixed with vanilla pudding. Then on top is a heap of Bavarian cream (vanilla pudding mixed with whipped cream) with the cream puff top. A light-tasting creamy dessert. For some reason, when I make these without the bananas, I use much smaller amounts of vanilla pudding and whipped cream. At least, this time I used large amounts of each. 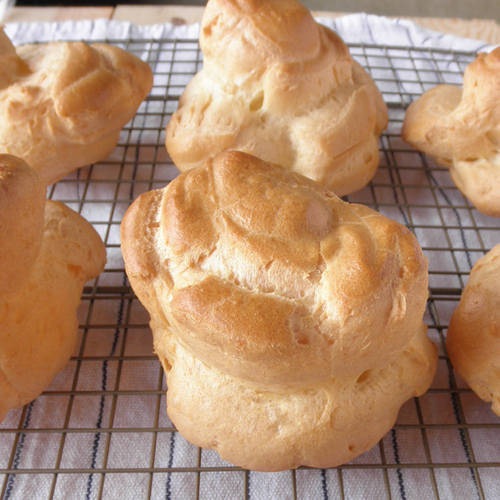 Today the recipe made 11 pretty large puffs. Normally I make about 15-18 smaller ones. Try this out. Leave me a comment if you find that my proportions are way off. I need to know. 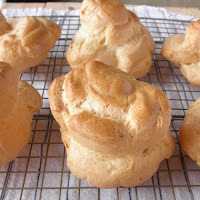 If you'd like to try cream puffs without the bananas, I've got that posted too. 1. Bring water and butter to a boil. Add the flour all at once & stir vigorously until it forms a ball. Set aside to cool, stirring occasionally. 2. When water-butter-flour mixture is cool, beat in eggs, one at a time, until smooth each time. Scrape into a gallon-size plastic storage bag. Snip off about ½” of one corner to make a pastry bag. 3. Preheat oven to 450°F. Chill the bowl and whisk attachment of a standing mixer, or other mixing bowl and beaters. 4. Squeeze out blobs that are about 3 tablespoons worth of the paste onto two parchment-lined baking sheets. 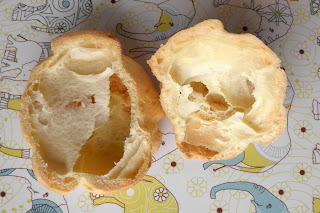 (More paste for larger puffs, less for smaller puffs) Blobs should be at least 2 inches apart. 6. Move puffs to wire racks. Poke each one with a toothpick or a sharp knife to allow steam to escape. Once cool, cut each puff horizontally in the middle and gently remove membrane-looking insides. 5. 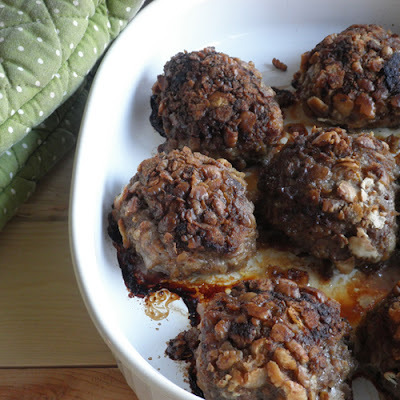 Bake at 450°F for 10 minutes—then turn oven down to 350°F for 15-20 minutes, or until well-puffed and light brown. 7. In a medium sized bowl, whisk together milk and pudding powder. Cover and refrigerate for 15 minutes or more. 8. Place banana chunks in a medium sized bowl and gently stir in about a cup and a half of the pudding. 9. Pour the heavy cream into the chilled mixer bowl. Whip on high speed until almost stiff peaks form. Then fold the remaining pudding into whipped cream. 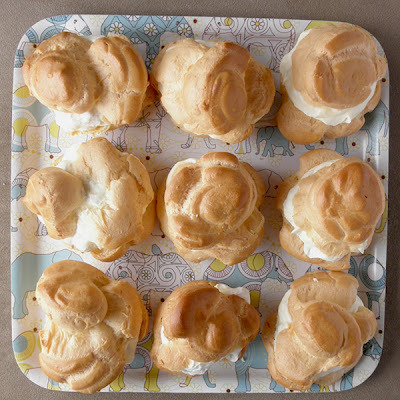 (Use 2/3 to all of the pudding, depending on how sweet you want your cream puffs to be.) Do not over-mix. 10. Spread a layer of banana/pudding into the bottom of a puff. Then with a spoon, scoop enough of the cream mixture into the bottom to just go over the top. Spoon some into the top to fill in. Return top to its puff. 11. Plate puffs and sprinkle with powdered sugar. Makes 12 large, 18 medium, or 24 small cream puffs. I was recently diagnosed with high blood pressure and told to lay off the sodium. I love salty things. I love lots of salt on my popcorn; I love french fries dipped in salt; I love most Frito-Lay products (Funyons in particular); I love deli meats and frozen pizzas. So this is a bit of sad news for me. I also love Mexican food. Imagine, now, how appalled I was the other night to notice that one Mission brand large burrito size tortilla has a whopping 590mg of sodium! That's 25% of the RDA! Sigh. So I turned to my trusty internet and googled, "flour tortilla recipes," and clicked on the first hit from allrecipes.com. The way I figure it, when I make 10 tortillas from the recipe, each tortilla only has 200mg of sodium, which is reasonable. I reduced the salt in the recipe below by about 25%, so mine had even less sodium, and they still tasted great. They're not quite as chewy/flexible as the Mission tortillas, but homemade tortillas have a charm of their own that, I think, makes up for that. These tortillas made great burritos without breaking, and they tasted fantastic reheated on a skillet and buttered. Mmmmm. My husband fixed one up with butter and sugar & cinnamon, and THAT was tasty as well. I think the key to making chewy homemade flour tortillas is kneading the dough thoroughly to develop that wonderful gluten, creating a stretchier tortilla. I've added lots of detail to the original instructions from allrecipes.com, because if you're making homemade tortillas for the first time, I think details are called for. Sorry if I get too wordy. 1. Place the flour, salt, add baking powder into the bowl of a standing mixer fitted with the paddle attachment. Mix on low for a minute. Add vegetable shortening and mix on low until it resembles cornmeal. 2. Switch to the dough hook attachment and add water. Mix on low until dough forms a cohesive ball. You may need to scrape the sides once with a silicone/rubber spatula. Once it's in a ball, increase speed to medium low and kneed until smooth and elastic (about 5-6 minutes). Cover with plastic wrap and let rest while you get your other tools ready. 3. Gather your cast-iron skillet, rolling pin, flour, canola oil, and large plate with a clean dish towel (to place finished tortillas). Very lightly grease a smooth, flat surface with canola oil by spreading a few drops onto the surface with a flat hand. 4. Remove dough from the bowl and cut into the desired amount of pieces. If your skillet is small, cut more pieces (up to 24); if you have a large skillet and want large tortillas, cut no fewer than 10 pieces. With your hand cupped over a piece of dough that is sitting on the greased flat surface, gently push the dough around using a small circular motion with your hand until you have a well-shaped ball of dough. 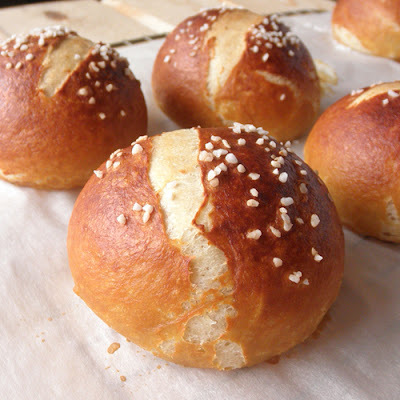 Place dough balls on a floured plate or piece of wax paper and cover with plastic wrap. 5. Once you have all of your dough balls, wipe your flat surface down with a paper towel to remove any canola oil residue. Generously flour the surface and place on dough ball down, flour the top, and flatten slightly with the palm of your hand. I start with a couple of strokes across the entire surface in opposite directions, just to get it started. Then I start so roll from the center and go out, turning my rolling pin about a quarter of a turn with each roll, so hopefully the tortilla will end up in a relatively round shape. Roll as thin as you possibly can if you want a thinner tortilla. You'll be surprised at how much they puff up when cooked. If you like thicker tortillas, don't roll as thin. You will want to dust off some flour before placing in pan to cook. 6. Preheat your cast-iron skillet over medium heat. Carefully transfer raw tortilla into pan, making sure you don't make any wrinkles. Cook for about 1-2 minutes on each side, or until light brown spots appear. My skillet is fairly large, as were my tortillas, so I had to move it around once a crust was formed on one side, to make sure the edges got cooked a bit on the hot spot of the skillet. 7. Repeat with remaining dough balls. 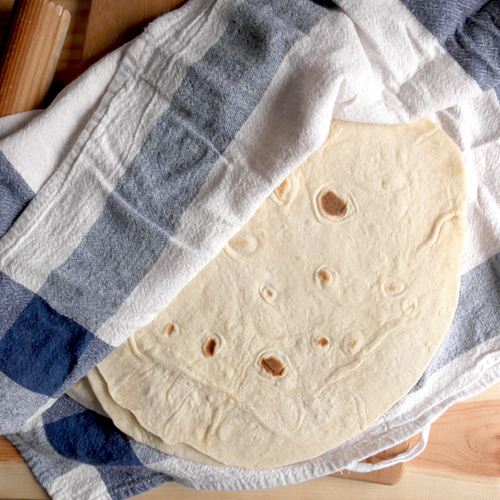 When a tortilla is done, put on a dish lined with a clean dish towel folded in half to cover the tortillas. You can stack cooked tortillas on top of one another as you go. 8. Store leftovers in a zip-top bag in the refrigerator. Makes from 10 large to 24 small flour tortillas.